Did you know that God loves a good party? It’s true. He loves music, dancing, and anything fun. I can prove it, too, because a few months ago I personally saw Jesus rock the 12-bar blues. We just loved on the people at the shelter. It was an amazing day! 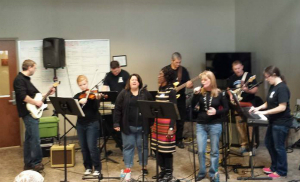 I was privileged to emcee the worship and lead the band. We started out singing worship songs and you could really feel the Presence of the Lord. After we had been playing a little while, though, I felt like we needed to release JOY into the atmosphere. The Kingdom of God is righteousness, peace, and joy, right? So whenever you release those things into a place, people are immediately transported into an encounter with the Kingdom, and radical things can happen. We just happened to have two electric guitarists with us that day that both love to play the blues. I’m a blues fan from way back, too. 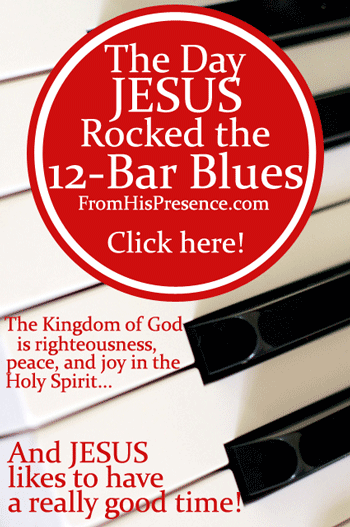 So we started rocking out some 12-bar blues in C.
And Jesus took over the 12-bar blues. As soon as we started playing the blues, the folks at the shelter started jumping up, dancing, and clapping along. The Lord gave us lyrics to sing: “Jesus likes to have a really good time. Whoa-doh-doh-doh, Oh, Jesus, likes to have a really good time.” We were partying and having fun! The guitarists were rocking it out. We had our healing team there that was ready to pray for the sick. When we started playing the blues, the Lord started giving us words of knowledge about specific things He wanted to heal. We started calling out those words of knowledge, and the healing team began praying for people. In between guitar solos, we’d call out another word of knowledge and the team would pray for more people. He did. The atmosphere was so full of joy–so full of the manifestation of the Kingdom–that people’s hearts were open to receive. As the healing team prayed for individuals, God healed pain and headaches and I don’t know what all else. He even healed one woman who didn’t even come forward to receive prayer! One of the ladies who worked at the Kitchen told our organizer later that she hadn’t wanted to come forward for prayer, but while we were playing and celebrating, God healed her anyway. She had been in a bad car accident and was having a lot of neck pain… and God totally healed her and took the pain away. All in the atmosphere of joy. God proved that day that He loves 12-bar blues. He also loves the Hokey Pokey; we did that one too, and people got up and danced. He loves these things because He loves to have a REALLY GOOD TIME. Jesus is full of joy, you see. God the Father, God the Son (Jesus), and God the Holy Spirit are happy. They are glad. They are full of joy. They love to have a great time! So my question to you is: Are you happy? Are you full of joy? Do you love to have a great time? Joyce Meyer often says, “If you’ve been saved, you need to notify your face.” How true is that! Too often, I think Christians start believing the lie that godliness is somehow wrapped up in being serious or even grumpy all the time. But Church, we need to rethink that theology. Jesus Christ has more joy than anyone else, according to Scripture. So let’s embrace joy. Let’s embrace fun. Let’s embrace godly dancing and joy and laughter! Jesus likes to have a really good time. Do you? Image courtesy of Rob Allen on Flickr via Creative Commons license.